If you are like most business owners, you have probably noticed a significant drop in the reach of your Facebook page posts. What I mean is this: you post something to your Facebook business page, and then crickets. The reality is that most of your fans never actually see it. This can be extremely frustrating, especially when you’ve invested so much time and money trying to get those people to “like” your page in the first place! And if you’ve ever tried to promote a product or service on your page, you have probably gotten even more dismal results. It can feel like Facebook doesn’t actually want you to succeed! The good news is that it is possible to promote your stuff via your Facebook posts, in a way that actually gets them seen by your fans. 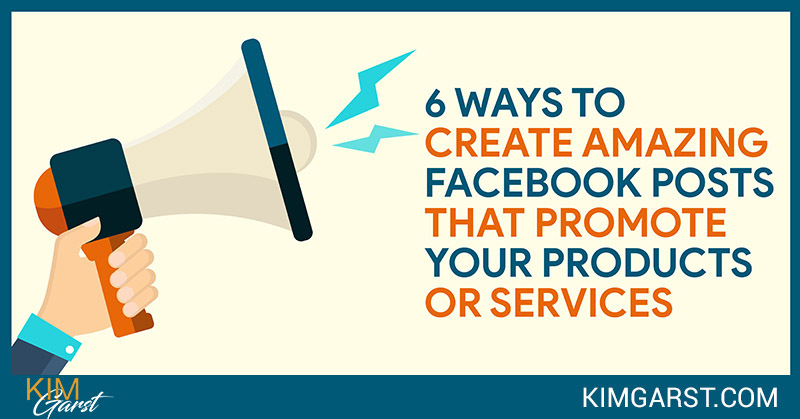 Keep reading to learn six ways to create amazing Facebook posts that promote your products or services! Studies show that people are greatly influenced by their emotions when they make purchasing decisions. In other words, you can talk about the benefits and features of your products until you are blue in the face…but if your prospects don’t feel some kind of emotional connection to your product, you are going to struggle to make sales! One way to help forge this emotional connection is to show real people using (and enjoying) your products. This will help your fans visualize themselves using and benefiting from your offerings in a way that words never can. A couple of years ago, Facebook started cracking down on posts that were primarily promotional in nature. Part of their definition of promotional posts was “posts that solely push people to buy a product or install an app”. One workaround for this is to put your product or services in context. Instead of just writing a paragraph or two about how great your product is and how/where to buy it, tell the backstory of your product. For example, if I wanted to promote a line of weight loss products, I wouldn’t simply post a picture and description of the products. Instead, I might share my personal story of struggling with weight, and how I would have given anything to find a product that would have helped and viola, I have found the solution! Not only will this type of personal backstory increase your post reach, it will be far more relatable, and will likely result in much higher conversions. Not every image or mention of your product needs to be blatantly promotional. Sometimes, simply getting your product in front of your target audience can be enough. 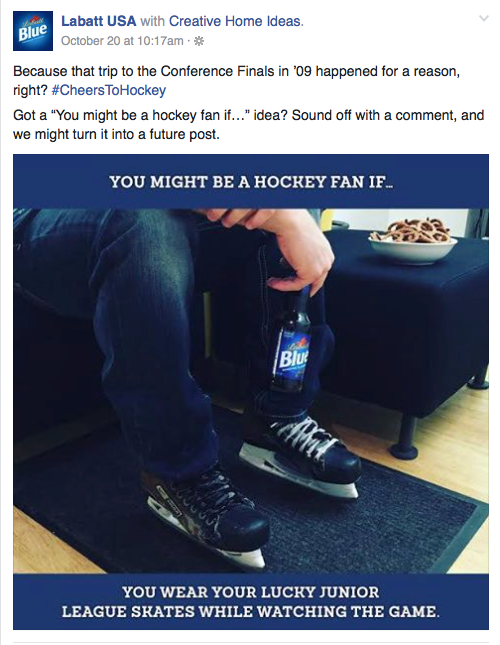 Take a look at what Labatt USA did with the post above. Instead of outright promoting/selling their beer in the post, they simply included it as part of the image. The caption and image are relatable to a certain segment of people (hockey fans), who will be far more likely to share this post than if it were blatantly promotional. Tutorials are a tried and true method of boosting clicks, views and engagement. While they can (and should) include references to your products or services, they’re so much more engaging than a product ad. Think about which common problems you can help your audience with, and then create a simple video that demonstrates exactly how to solve it. Question posts are great for getting comments and likes, which help to increase the overall reach of your post. They’re also ideal for getting your fans to feel like they’re being heard/listened to. 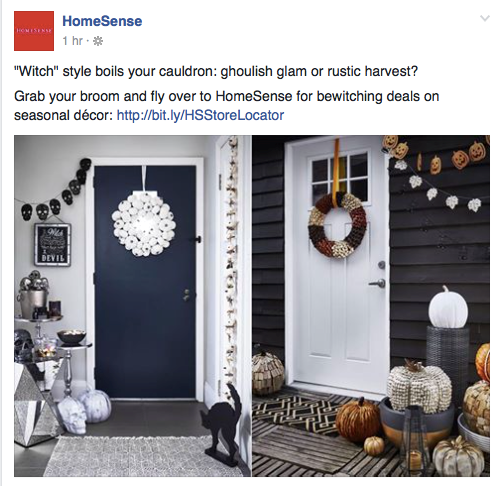 The post above from HomeSense is a great example of eliciting engagement (and therefore boosting reach), while also featuring/promoting products. Fans are asked to vote on which style of Halloween décor suits their taste. The images feature examples of products that could be found at the store, inspiring viewers to want to get in the spirit of the holiday themselves. 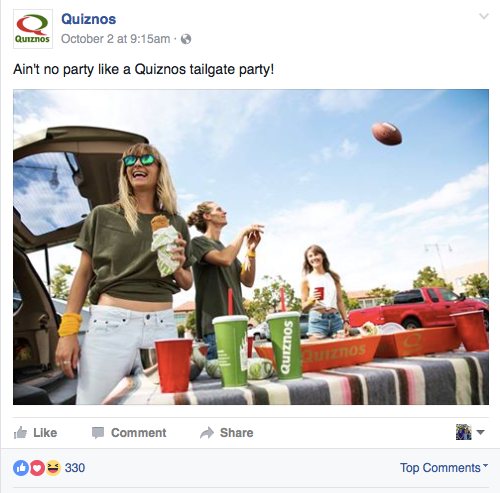 While the products aren’t being blatantly promoted, they’re front and center in the post and image, and will undoubtedly lead to increased exposure and sales. Online fashion retailers have this one down pat. Take a look at any of the big clothing brands – Banana Republic, Vera Wang, Dior – and you’ll see how they’re promoting not just their clothing, but a certain lifestyle. As we’ve already talked about, our emotions can significantly impact our buying decisions. When we see a certain lifestyle represented in an image, we start to equate the products and brand with the lifestyle that’s being portrayed. Think about what lifestyle your audience is aspiring to. Depending on your business and products, this could look very different. For instance, if you sell outdoor gear, your imagery could convey a casual lifestyle with a focus on nature. If you sell gourmet baking ingredients, you may want your posts to convey a sense of high-end luxury (e.g., images of cooking in a gourmet kitchen). If you want to promote or sell your products or services on Facebook, it’s important to remember that your primary job is to entertain, educate and inspire. And any time you can do this while also promoting your stuff, you’re on the right track. What kinds of Facebook posts do you use to promote your products or services? Share below! This blog gave me ideas for Facebook promotion that I hadn’t considered before. Thank you. Nice Post Point 1 Show real people enjoying your products adds trust factor to users, i do agree. Thanks for Sharing the post! Thank you so true. We need to engage anf offer solutions for the customers go view our posts as useful which will translate to sales. Thanks Kim, Several ‘GOLDEN NUGGETS’ here! Thanks for pointing that out Judith! It has been fixed! Thanks for this blog. Simple, easy things to consider. I appreciate it. High five! I use (Tell the backstory of your product) by set true story from my connections with my visitors about them problems with products / brokers, and how we solve them problems OR tried to solve it. It’s really give me leads/sales and most important re-visitors and true fans. Will check other ways, thanks. Thanx good ideas, I plan to ask some questions first then get some pics of people using my products. Kim, you never disappoint when it comes to your blog posts. I learn so much from you (especially when it comes to Facebook marketing). Step number 3 is genius. I’m sharing this blog on my social media marketing page now. Thank you for the golden nuggets am definitely going to try this to get engagement on my page. This is helpful and true. People love questions and they like be to see you use your product, excitement is key!!! This is really nice post if you are engaging your audience through the images, videos, infographic or Gif, you can easily draw your audiences attention with your services or brand. what an amazing, educating and inspiring blog. thank you. backstory is the one that I go for..